Pocket Knives on Planes Again? For the first time in over a decade, you can have a pocket knife in your carry-on. Home » Aviation Articles » News » Pocket Knives on Planes Again? 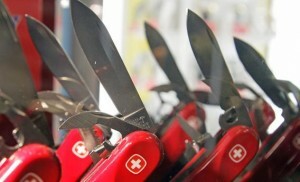 Airlines to Allow Pocket Knives on Planes? Ever since the terrorist attacks on 9/11, knives of any and all varieties — even small ones — have been big no-nos on commercial airplanes. It didn’t even matter if it was tiny, key-chain attachment. If it had a blade, it was not coming on the plane. But starting in April, the Transportation Security Administration (our friend, the good ole’ TSA) will allow pocket knives on planes as carry-on items. This is an interesting and potentially impacting change for those of us in the aviation world. Among those objecting to the change are congressmen, pilots, flight attendants and air marshals. But TSA administrator John Pistole is standing his ground. Pistole announced last month that pocket knives with blades up to 2.36 inches long will be allowed starting April 25. Also allowed for the first time in 12 years: Small bats, hockey sticks, and golf clubs, much to the relief of leisure and sports fans everywhere. I guess hockey teams can take to the skies again. So what do you think? Should pocket knives on planes be allowed? By allowing them, is there a potential danger being re-introduced into commercial flying? Or are you simply happy to be flying a hobby plane and not having to worry about the security circus. For more on the changes, check out this story in USA Today.